In his birthday honours at the end of April 2016, His Majesty, King Willem-Alexander of The Netherlands made five new knights on the island of Curaçao, a far-flung part of the Dutch Kingdom. 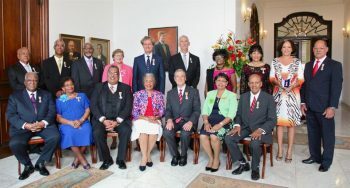 One of the five was not a Dutch national at all but “our man in the Caribbean” for over 35 years, Antony Owers OW (1961-69), seated on the Lady Governor’s left in the picture, for his “continuing support and work, especially as treasurer, of many social organizations”. The official title in Dutch is “Ridder in de Orde van Oranje-Nassau”. No sword was involved and it is not clear whether Her Majesty Queen Elizabeth gave her permission! Owers was with the accounting firm KPMG for 30 years in London, São Paulo, Brazil and Curaçao where he has lived since 1984. From 1997-2013 he was the UK’s Honorary Consul to the Dutch Caribbean islands (not exactly a hardship post but for example, he made more than a hundred visits to the prisons and police cells in that time to help ensure British and Commonwealth citizens who had been detained were reasonably treated). Always a keen sportsman and wishing to see sport flourish, he succeeded Lord Weatherill as Patron of Croydon Harriers in 2007; Owers was track captain of Croydon Harriers in the mid 70s and retains a close friendship with his former coach, former Whitgift sports teacher, and a pillar of Croydon Harriers for some 50 years, Mike Fleet. On visits to the UK, Owers still turns out occasionally for the OW Fives Club (when overseas players are permitted!). He and his great friend Tony Hamilton OW (1963-69) (who remains a prominent Vs player) reached the schools Vs final in 1969, and they are hopeful that a Whitgift pair will go one better soon.